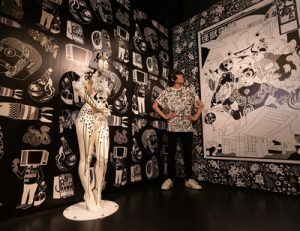 Madame Tussauds Hong Kong unveiled the ground-breaking presentation — Lady Gaga as the canvas of Jan Curious’ playful black-and-white illustrations, an unprecedented local to global cross-boundary collaboration. Jan Curious also designed a new issue of Jan Chan Daily News for the attraction, creating a fun yet imaginative check-in spot for visitors to explore. Previously invited by Merlin Magic Making, Jan Curious became the first artist who involved in the distinctive finishing touch for wax figure at Madame Tussauds. Black-and-white poker dots, flowers, eyes and tears, all conjured up into compelling patterns that living up the striking style of Lady Gaga, winning widespread acclaims internationally. 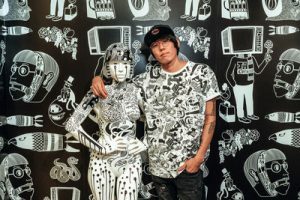 Among the three black-and-white murals, several works under the series of Jan Chan Daily News are especially created for this exhibition. Jan’s works express strong local elements. Undoubtedly, he is a daredevil when it comes to innovation, which also strongly demonstrated in his eye-catchy works where taking the Peak Tower as the backdrop, titled Monster invasion of the Peak Tower and Spaceman fallen asleep while playing mobile phone. “Recently, ‘checking-in’ on social media has become a popular trend. By introducing check-in areas with artistic themes, our goal is to turn our attraction into a hot check-in place. We hope to attract visitors to come and see our works, while at the same time, check-in and share the fun they have here with their friends through social media,” said Jenny You, General Manager of Madame Tussauds Hong Kong. Next to the exhibition is the custom-designed gallery of Japanese artist Yayoi Kusama. The Yayoi Kusama Gallery invites visitors of all age to explore her inner world and release oneself in the experience of ‘self-obliteration’.